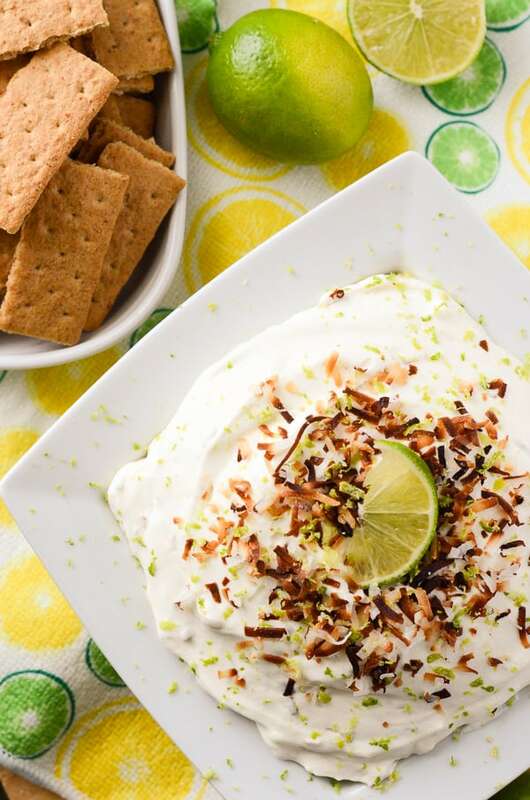 A fluffy, refreshing, and versatile desert hybrid – key lime cheesecake dip combined with freshly toasted coconut is perfect for graham cracker dunkin’! Gotta write it down so I don’t forget it tomorrow! And now, you’ve totally ruined your sleep cycle, but at least you’ve got a potential gold recipe waiting to be cooked up and perfected. 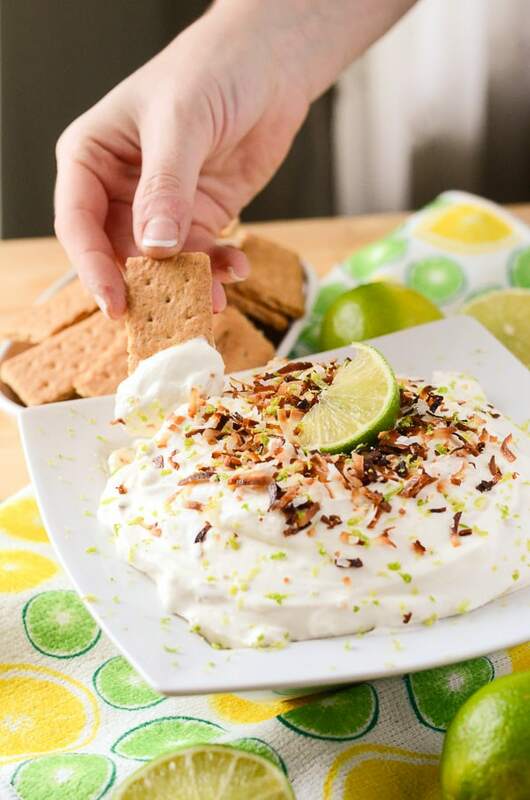 That’s pretty much exactly how this Coconut Key Lime Cheesecake Dip came to be, and I thought it would be the perfect snack to bring to this week’s #SundaySupper Pool Party! I’m a big fan of dips. Salsas, hummus, guacamole. They’re an excellent conversation piece, make for a wonderful party food, and are also great to eat when you can’t be bothered to shut up long enough to chew a bite of non-appetizer food. It wasn’t until last year, after I started this little blog, that I discovered how delicious sweet dips can be. After scouring Pinterest for over an hour trying to come up with a quick dessert to take over to my Bestie’s house for an impromptu wine & sweets pool party for four, I ended up deciding on a Nutella dip, of which my BanaNutella Dream Pie was born. Hence why I find this dessert to be a perfect fit for a pool party spread. It’s cool, refreshing, light, and incredibly easy to eat – no spoons or napkins required, just whatever you want to eat it on. Graham crackers are a great standby, but I’ve also tried it on strawberries, apple slices, fresh mango, and frozen pound cake sticks, and haven’t been disappointed. The toasted coconut was actually an afterthought, because I felt the bowl needed a bit more color, but the flavors just worked. If you were to marry a key lime pie with a toasted coconut cheesecake, this is the kind of luscious offspring they would produce. Gotta get in all the summer flavors I can before autumn gets here and I’m all about pumpkin ‘n’ spice! Toast coconut flakes in a medium frying pan over medium-low heat, stirring frequently, for about 5 minutes, until browned. Cool. In a large bowl, combine cream cheese, sweetened condensed milk, and key lime juice and mix with a hand mixer until smooth. Fold in toasted coconut and half the zest with a rubber spatula, reserving 1 Tablespoon for garnishing. In a clean bowl with a clean whisk attachment, whip heavy whipping cream and granulated sugar until soft peaks form. Fold whipped cream into cheesecake mixture. Refrigerate 15-30 minutes before serving. When ready to serve, garnish with remaining zest and toasted coconut, and enjoy with graham cracker, strawberries, or pound cake slices. What was the best key lime dessert you’ve ever had? A pool party spread is not made of one dish, alone! Take a look at what the rest of the #SundaySupper crew brought to today’s shindig! I don’t think this would make it out of the kitchen to the pool. I’d be inside hoarding it all for myself. I totally get that! I ate about 1/4 of this before I realized I hadn’t taken pics yet!! Yep, I would be hiding this to keep it all for myself. I love anything with limes!! I’m such a lime-aholic thanks to my hubby! While I am sure the dip is luscious, and I do plan to make it, your WRITING has won me over as a new follower. THe post was a fun as the food! I like the idea of using the graham crackers as dunkers, reminiscent of the crust of the pie. That’s exactly what I was going for – deconstructed pie. 🙂 They taste so good together! Grahams are a great idea for this dip! I can see myself getting into MAJOR trouble with a dip like this. As in, I’d be the person in her coverup totally hogging the entire thing as others swam and hung out, then casually slinking away from the table when it was all gone. Because oh my goodness, cheesecake DIP? Sign. Me. Up! LOL you’d have to share it with me, girl! I’m more of the “lounge” by the pool rather than swim type, too! How creative! Would love to dive in right now — and such a beautiful presentation! What’s not to love?!! Great combination for a summer dessert!! 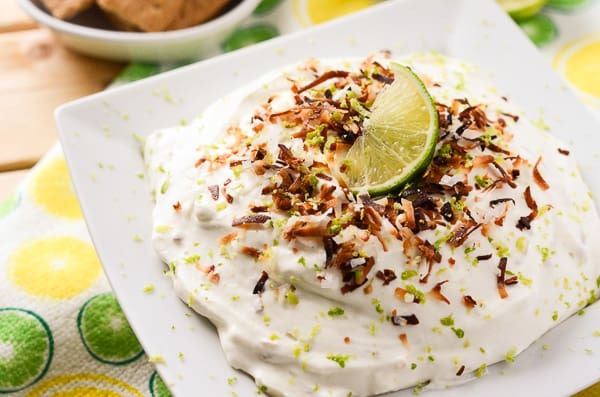 I love the idea of coconut w key lime. 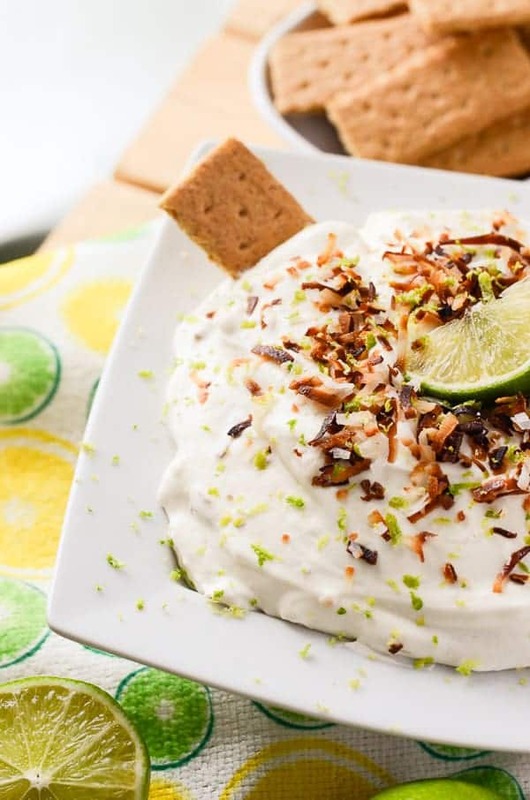 I love cheesecake dip and a coconut key lime version sounds amazing! What a great combination for a dip Erica! Pinned and shared and hope you will share it with the Say G’day Party! Haha! I know exactly what you mean – glad you popped out of bed so you could share this recipe! dooooood this looks and sounds amazing! OBVIOUSLY being in Florida, I’m obsessed with key lime anything. I make this key lime cake that my family has been making for years and so that’s my favorite key lime dessert, BUT this may very well beat it.